Dubbed as the world’s most famous vandal, Banksy is considered the most controversial artist in the field of street art today. This enigmatic artist is most known for his stencils painted in a variety of different public places that range from the streets of London to the wall of West Bank, separating the conflicted territories of Palestine and Israel. Banksy has been active as a graffiti artist since the early 1990s, starting out in the underground scene in his home city of Bristol in England with a graffiti crew by the name of DryBreadz or DBZ. It was during this time that he started developing his stencils as a more convenient way of painting since he is admittedly not quiet good with free-hand graffiti as well as to cut his time into half to avoid being arrested for vandalizing public spaces. He then relocated to London where his art gained more notoriety and recognition for its subversive political views. 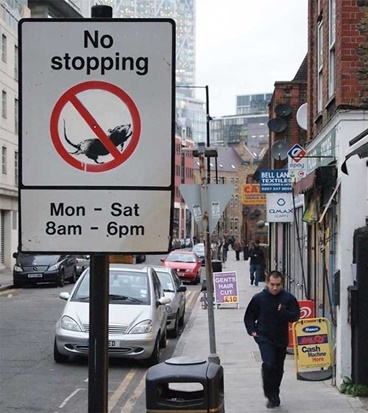 Although Banksy also works with many different types of art media such as print and installations, his fame is largely attributed to the anti-establishment messages of his stencil based style of spray-painted images that are sometimes combined with other elements found in the streets such as traffic signs. His images depict his satirical criticism of socio-political issues aimed at political hypocrisy and social injustice. Key elements of his signature include rats as his ultimate role model for the insignificant and unloved as well as chimps among others. Banksy’s style and messaging are influenced by fellow street artists such as the French artist Xavier Prou famously known by his moniker Blek le Rat, the Father of Stencil Graffiti who first painted rats on the walls of Paris back in the 1980s and the musician 3D, who brought free-hand spraycan-style graffiti from the streets of UK to the subways of New York. His works are also inspired by contemporary artists like Andy Warhol and classical artists like Monet and Leonardo da Vinci, often creating witty and dark-humored versions of their popular paintings. 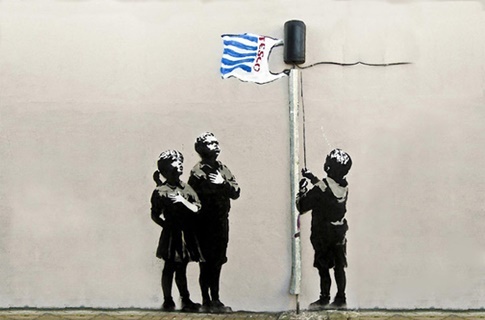 Banksy made his criticism of the evident capitalist greed in London and unjustness of globalization more controversial and more popular at the same time by inserting the idea of “brand” and “vandalism” or brandalism in his work. It is an idea that grew out from the US punk culture that promotes anti-establishment, condemns “selling out”, and adapts the language of advertising to subvert the capitalist messaging the ad endorses. Banksy’s works infused with brandalism attacked major commercial brands like Nike and Tesco, which was long opposed by the locals of Bristol for its underhanded plan of opening a supermarket store that would subsequently kill the area of its local character. 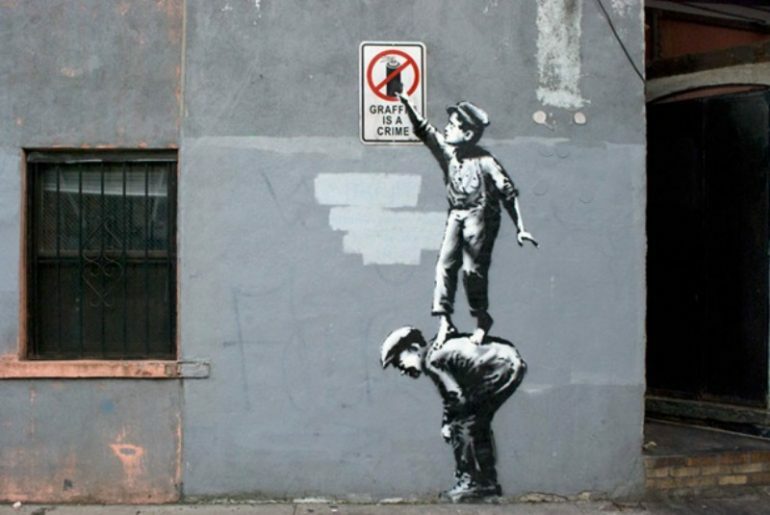 Banksy’s success and his viral impact in street art is coined by the CNN correspondent Max Foster as “the Banksy Effect”, or the increasing interest in street art. Through his work, Banksy has become responsible for making graffiti recognized as art. Among other influential street artists like Keith Haring and Jean-Michel Basquait, he is able to bridge the elitist and exclusivist world of art to a wider set of audience. Advocating his artistic belief in the direct connection of the artist to his constituency, Banksy is paving the way for simultaneously garnering genuine public interest and investment in art as well as making opportunities for talented artists striving to make a living by selling their art. Even with more than a two-decade run in the street art scene and with numerous theories circulating about his true identity, Banksy maintains his anonymity up to this day while continuing to make waves in the global art scene with his street art and activism.